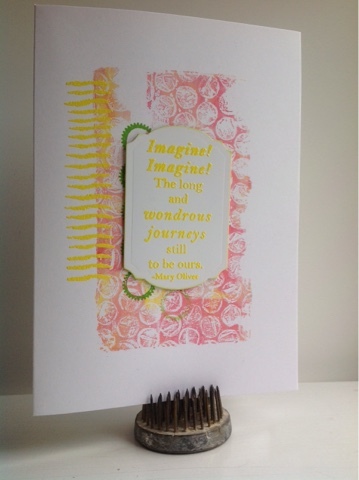 This card was inspired by Allison Hall, who combined Ellen Vargo stamps to her prints in the latest post. For some reason the sentiment looks really crooked in this picture... it isn't in real life! Besides Paperartsy, I'm posting for the WOW challenge (anything with embossing goes). 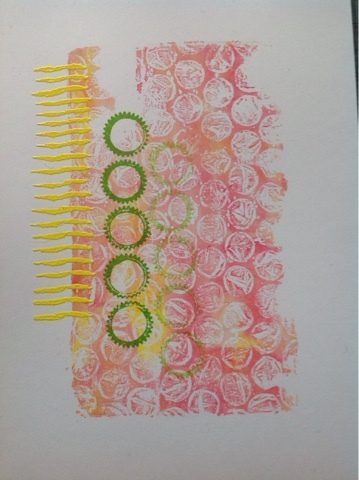 I used my 3x5 plate, Fresco paints in Blush, Lemon and Prawn and bubblewrap to draw a print straight on my card base. 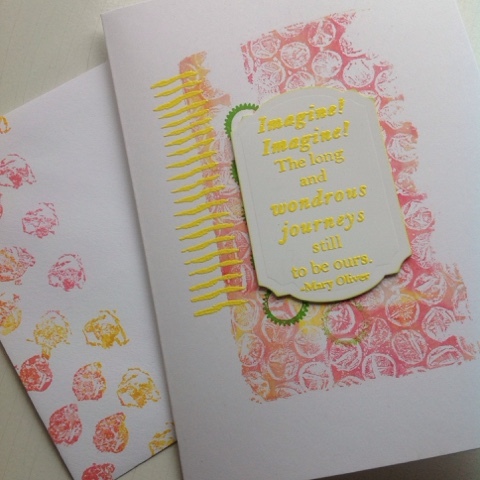 The yellow didn't really show, so I used Sunny yellow WOW embossing powder and Ellen Vargo stripes on the left side. I wanted a touch of green and stamped EEV bottle caps next. I didn't enjoy the result, the first image was too strong, the second too weak... to cover up the contrast I decided to cover the centre with a sentiment. The sentiment is from Sara Naumann, I embossed it first and then found that a Tim Holtz die was just about the right size for it. The die does some embossing on the edges, and part of the heat embossed yellow got squished, but straightened out when I gave it a bit more heat. I mounted the sentiment on low foam tape and stamped the envelope with some more EEV stamps.